To avoid having to pick up the required warp threads to create each row of a supplementary weft pattern, Lao-Tai weavers have devised several methods of storing these patterns on their loom. The system allowing the most pattern rows to be stored in the least space can be seen at far left in the drawing by Corinne Matesich below. The weaver has her hand on the reed in the beater, and behind that are the two fixed heddles that are used to create the ground weave. Behind that, a sword is holding the pattern shed open, and at far left is the pattern storage system of long string heddles. 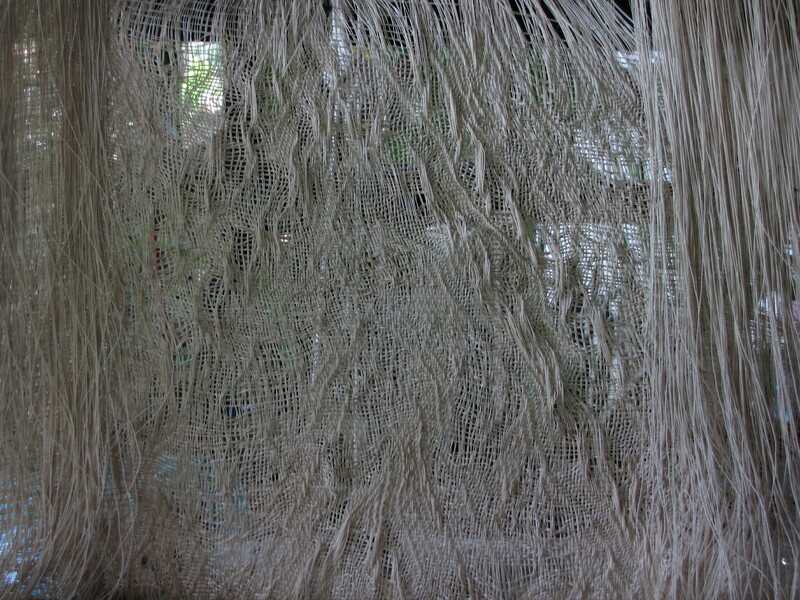 From the weaver’s seat, we can see that this pattern storage system is a mesh of horizontal and vertical strings. After throwing the ground weave pick, she turns turns the sword to open the pattern shed and inserts the pattern threads to recreate the pattern in her fabric. Then she repeats the process to transfer each row of the pattern from the pattern heddle storage system to the warp. As Carol Cassidy explains near the end of the following video, the weaver does not have to follow the entire sequence of the stored pattern slavishly. She is free to use sections of it, skip sections, repeat sections, and to mirror sections. In reality, there are two stages of creativity: the first when the master template is created, and the second according to the weaver’s discretion with colours, and which sections to repeat or skip. 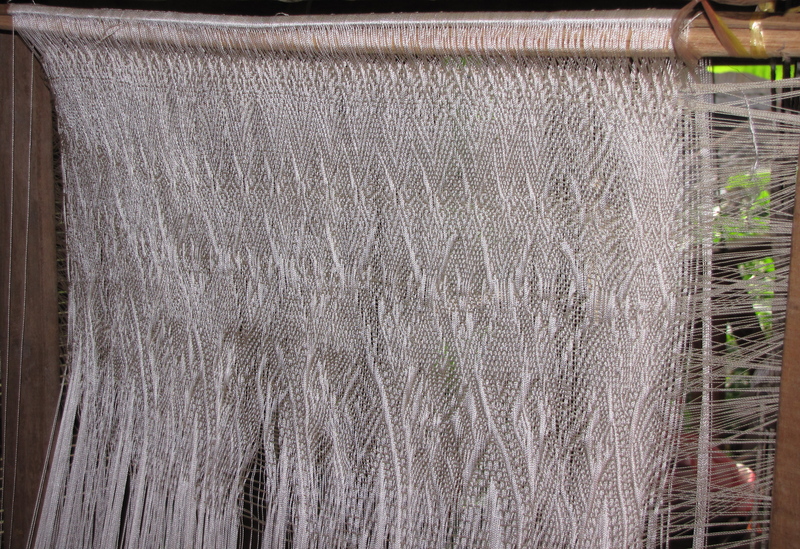 The same template can be woven with a single pattern colour (kit) or with several colours (chok) and both uses can sometimes be seen in the same weaving. 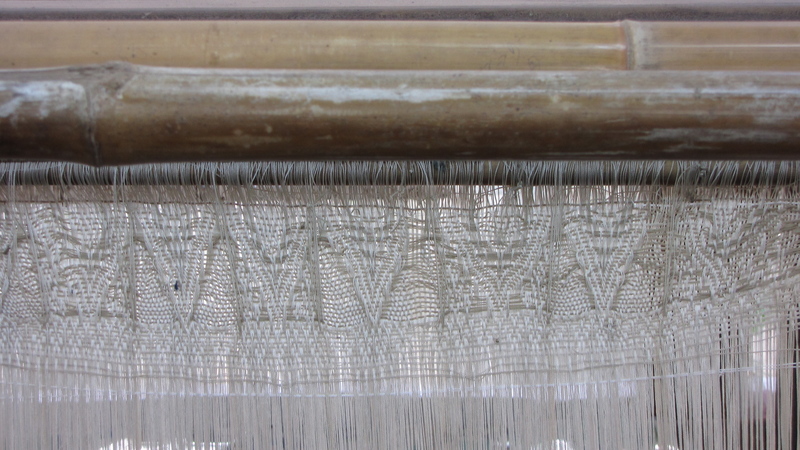 To mirror the pattern, the weaver takes the next pattern string stored below the warp, sweeps it back & forth to separate the vertical string heddles, and then re-inserts it above the warp and stores it by hanging it on nail in a frame above the warp. This mirroring can be seen in the teal and white weaving further down this post. Below is the beginning of a new pattern storage system. Only the vertical loops are in place. This entry was posted in Lao Techniques and tagged Asia, Lao-Tai, Laos, loom, pattern heddle, Textile, traditional, weave by Wendy Garrity. Bookmark the permalink.